This performance explored the question, What does it mean to be "out of place" as a Jew? When one deliberately chooses to locate herself  as I do  outside of essentialist modes of Jewish identity formation, and especially those that emphasize identification with the state of Israel as a central mode of Jewish identity? Using placards and protest signs I attempted to "demonstrate" some of the complexities of self-emplacement as a radical, progressive, secular, non-Zionist Jew, and to engage members of public in dialogue. 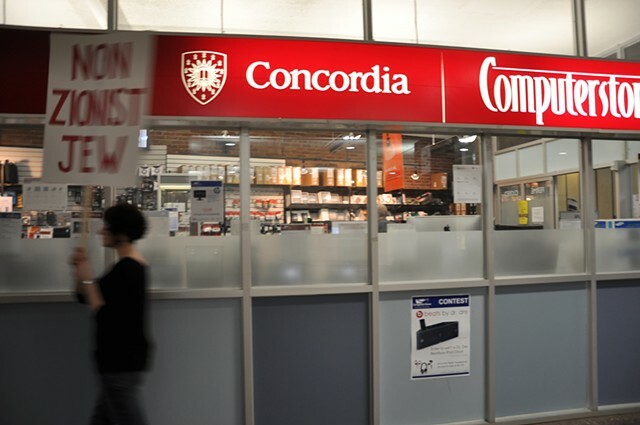 The work was performed in the Hall Building at Concordia University  a site of tension and confrontations between pro-Palestinian, and pro-Israeli students. Performed as part of the Dis/Locations: Being Out of Place conference sponsored by the Centre for Interdisciplinary Study.